We’d love your help. Let us know what’s wrong with this preview of Lovely, Dark, and Deep by Justina Chen. That's exactly what happens to Viola Li after she returns from a trip abroad and develops a sudden and extreme case of photosensitivity -- an inexplicable allergy to sunlight. Thanks to her crisis-manager parents, she doesn't just have to wear layers of clothes and a hat the size of a spaceship. She has to stay away from all h What would you do if the sun became your enemy? To ask other readers questions about Lovely, Dark, and Deep, please sign up. This review has been hidden because it contains spoilers. To view it, click here. I swear, every synopsis I read, it leaves by surprise when I actually read the book, and this is one of them. I was grateful to read the book, because I can relate to the main character's situation, even though I don't have what she has. This is about a girl name Viola, who wanted to be journalist, covering stories in foreign countries while being an advocate. But thanks to her condition (which is called solar urticaria), her parents are shielding her from the outside world and being cautious to I swear, every synopsis I read, it leaves by surprise when I actually read the book, and this is one of them. I was grateful to read the book, because I can relate to the main character's situation, even though I don't have what she has. This is about a girl name Viola, who wanted to be journalist, covering stories in foreign countries while being an advocate. But thanks to her condition (which is called solar urticaria), her parents are shielding her from the outside world and being cautious to keep their daughter safe. At first, I didn't understand Viola's behavior, because it seems like she's not taking it seriously with her condition, but I realized that Viola's only seventeen and is doing her best to live a normal life, despite how her parents are being protective of her. But with the help with the guy named Josh (who looks like Thor, guys), she's doing her best to live her life. When Viola was first diagnosed, she's not used to all this. It's all new to Viola and she was doing her best to adapt. But no matter how hard she tries, everyone whom Viola loved and cared viewed her as "sick" and started to pity her. Even Viola's parents were not helping her because of the way they were treating her. I thought maybe her parents knew that it's not right for them to all pity and give them special treatment, considering that they're crisis managers. Important fact: in the medical field, you can't give patients pity, even when they're grieving for their condition. Even if they lost or have broken a limb, you can't pity them when people are upset about their condition. You have to be more empathetic and treat them as if they're normal human beings (which they are). There is a difference between being pity and empathetic. Empathy: showing an ability to understand and share the feelings of another. Pity: Feeling sorry for someone of their suffering and condition. And I know how Viola feels, because I have over-protective parents who don't want me to go outside a lot without them; they're scared if I get hurt, since they have watched a lot of news. And just like her, I took risks (not something like Viola did), until I gave in to my parents words. I was afraid to get hurt again by people. But hey, how will I know if I'm going to hurt again? At least later on in the story, Viola learns to adapt while testing herself (because of course you have to go out, even if you have a condition). Plus, Viola is being considerate with her parent's feelings while making arrangements with her and her parents (I love it).Now, Viola figured what she wants to do while working things out with her condition. I've really enjoyed story. One thing that stood out to me was how the language was quirky because, of course, Viola's a nerdy girl (in a good way). I like how the author is doing that while trying to adapt to formal writing style. I really enjoyed reading Lovely, Dark, and Deep! It's a really good young adult novel for the younger YA readers (although it doesn't mean older readers can't appreciate it either) and something I wish I had available to read when I was a tween going on teen looking for books that weren't VAMPIRE VAMPIRE VAMPIRE to read. Viola and her struggles are super relatable. As an Asian-American teen, I felt like this was such a good representation of one end of the Asian parent scale--parents might not be super school-focused, but they can be so overprotective. And Viola's parents aren't even that unbelievable. They're a tad exaggerated due to their crisis-managing job, but a lot of what they did is exactly what my parents would do if I was in the same situation. I did think Viola was a little immature and a bit young, but her youth makes it more accurate as she's not the super mature adult-acting teenager that's never like real life but somehow permeates the young adult genre. YA is filled with characters who are basically grown ups in teen bodies (especially with things like fantasy) and it makes our expectations on how to act unrealistic. But I feel like Viola is a really solid representation of what teens really are like. We care too much about school and college and we don't go on adventures in crazy places and we're a little silly and immature sometimes. I thought the whole photosensitivity premise was really cool and I actually liked how Chen wrapped up the whole book and the photosensitivity part. The way Viola takes charge and in the place Chen finishes the story has a lot of meaning and it's one of the only contemporary endings that I felt like suited the book. There were two things I wasn't really keen on. One was Viola's passion to be a journalist abroad. I just didn't find her journalism desires to feel grounded or explained enough, and I continuously wondered why she wanted to go into journalism. If what I read of Viola & her journalism desires was a college essay, I would have denied her because I just didn't understand where her passion really came from. It felt like the same few justifications were being repeated, and I wish Chen went a little more in-depth with that. The other thing I wasn't super into was some of the intercharacter relationships, specifically the one with Josh. I wasn't really into Josh and he felt kind of bland to me. It was more like Josh was a plot point rather than a romantic-interest character. So a really great coming of age story, but a meh romance is what I'm really trying to say. I also kind of wish some of the other character relationships were expanded on more, but it is a short book and would have taken the focus off of Viola, so I understand why they weren't more hashed out. Thank you so much to Jean Book Nerd and Justina Chen for the advance reader's copy in exchange for an honest review! I have been a fan of Justina Chen's ever since I read North of Beautiful and every book since has only made me appreciate her more. I've loved every book of hers that I've read, and this one is no exception. It's scary to think about how quickly your life can completely change, and th I have been a fan of Justina Chen's ever since I read North of Beautiful and every book since has only made me appreciate her more. I've loved every book of hers that I've read, and this one is no exception. It's scary to think about how quickly your life can completely change, and that's really shown here. Viola goes from having the kind of life we all take for granted (being able to leave the house and do anything she wants, at any time, without thinking about it or taking precautions) to a life where she can only safely go outside at night, and even then not for very long. Even light through a screen can affect her. And I can't even imagine having to sit in the dark and not even be able to be on my phone or computer, or even watch TV. AND because this is so rare, they don't even know what caused the sudden onset. But there's also a lot more to Viola than the sudden allergy to light. She's in love with the show Firefly and she's also hoping to be a foreign correspondent. She has so much passion for the world and trying to fix everything that's wrong. She's an inspiration and that's why it hurts so much when she starts to lose the ability to do the things she loves most, and in a lot of very real ways, her future. I love this book so much, you guys. SO MUCH. And I hope I don't have to wait long for another Justina Chen book. Lovely, Dark, and Deep by Justina Chen is a brilliant novel about chasing life even when what that life might be dramatically different from what you were expecting. Lovely, Dark, and Deep is beautifully written, with a likeable heroine and a nice mix of uplifting messages and humour. Viola has her life all planned out - first travel overseas with her Aunt, then major in journalism before becoming an international foreign correspondent traveling to war zones and other dangerous places to expose Lovely, Dark, and Deep by Justina Chen is a brilliant novel about chasing life even when what that life might be dramatically different from what you were expecting. Lovely, Dark, and Deep is beautifully written, with a likeable heroine and a nice mix of uplifting messages and humour. Viola has her life all planned out - first travel overseas with her Aunt, then major in journalism before becoming an international foreign correspondent traveling to war zones and other dangerous places to expose and report the truth. But when Viola develops a reaction to the sun, her whole world shifts - first with sizeable hats and an abundance of sunscreen to blackout curtains and limited screen time. Her diagnosis coincides with meeting Josh - graphic novel writer, Thor-look-alike - who carries his own secrets and grief. Viola is sure that her condition will not limit her, but testing the boundaries brings many risks for which even Viola could never have planned. I loved Justina Chen’s North of Beautiful and Lovely, Dark, and Deep sounded like a perfect novel to recommend to readers who enjoyed Yoon’s Everything, Everything and Gornall’s Under Rose-Tainted Skies. 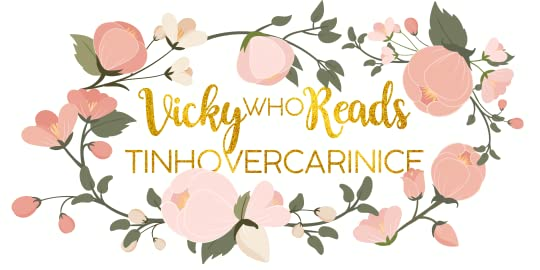 While those two books focus on a girl’s transition from life trapped inside (for various reasons) to exploring beyond their boundaries, Lovely, Dark and Deep starts with a character who has the whole world open in front of her only to have everything change when she develops a skin condition that means she can no longer plan holidays, follow her intended career path or even go outside in the sun. I loved Viola’s voice. From her little asides and comments, to her lists and humorous take on her parents and their crisis management ways, she makes for a very likeable protagonist and narrator. I also really enjoyed the meeting of her many talents and hobbies, from cooking to researching. Lovely, Dark, and Deep will appeal to many readers with its wide array of interest points, including cooking, graphic novels, writing, travel, and journalism. Romance is a large part of Lovely, Dark, and Deep but it never overtakes the focus of Viola’s story of coming to terms with her diagnosis and how she will let it impact her life. Lovely, Dark, and Deep is ultimately a coming-of-age story, about friendship, family, and love, about boundaries, grief, goals, dreams, overcoming challenges and living life no matter what. I loved the symbolism portrayed through the formatting - each chapter page slowly darkening until reaching the deepest of black, and the text on those chapter title pages changing from black to white at a pivotal moment. The use of lists, segments from Viola’s parent’s Crisis Management Handbook and other little formatted sections from Viola (often humorous) make Lovely, Dark, and Deep all the more interesting, unique and enjoyable. 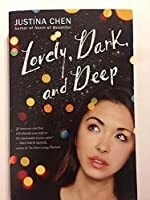 Lovely, Dark, and Deep is a wonderful YA contemporary novel about facing the challenges of life and learning to adjust, a celebration of love and the craziness of family, and a positive, diverse representation of disability. Thanks to @scholasticinc for the free book to share with @kidlitexchange ! LOVELY, DARK, AND DEEP by @authorjustinachen comes out on 7/31/18 and is book 2 for my #30booksummer ! Viola Li (biracial Asian/white) is a senior in high school who develops an extreme case of photosensitivity (allergy to light) after a trip abroad to Africa with her aunt. Her crisis manager parents put their professional skills to work to manage her condition and soon Viola is wearing huge hats and sta Thanks to @scholasticinc for the free book to share with @kidlitexchange ! LOVELY, DARK, AND DEEP by @authorjustinachen comes out on 7/31/18 and is book 2 for my #30booksummer ! Viola Li (biracial Asian/white) is a senior in high school who develops an extreme case of photosensitivity (allergy to light) after a trip abroad to Africa with her aunt. Her crisis manager parents put their professional skills to work to manage her condition and soon Viola is wearing huge hats and staying in dark rooms. This puts a bit of a damper on her burgeoning love life with comic artist Josh, as well as her future plans to become a journalist. When her condition is revealed to be much worse than she thought, all Viola’s dreams are at risk. 1. Totally hilarious parent-child interactions in which both employ research and negotiation skills to their advantage. 4. Food! Viola loves to bake for advocacy bake sales, Souper Sundays to watch football games and any other occasion. My mouth was watering as I read. I loved that the main character was part Mongolian, since there is literally no Mongolian rep in YA literature- Asian main characters are written only by Asian main characters. I appreciated this a lot. Loved, loved, loved! Review posting tomorrow. Lovely, Dark, and Deep, by Justina Chen, it sounds like a adequate book just by the title, and it was. Lovely, Dark, and Deep was about a teenage girl who was living life to the fullest when her life gets to the best of her. She found out that her now ex-boyfriend was using her, she was diagnosed with a sun allergy, and she meets a new guy, better known as Josh who tries to take her heart away. But she doesn't know if her heart is ready to get taken again. Even if she was ready she couldn't poss Lovely, Dark, and Deep, by Justina Chen, it sounds like a adequate book just by the title, and it was. Lovely, Dark, and Deep was about a teenage girl who was living life to the fullest when her life gets to the best of her. She found out that her now ex-boyfriend was using her, she was diagnosed with a sun allergy, and she meets a new guy, better known as Josh who tries to take her heart away. But she doesn't know if her heart is ready to get taken again. Even if she was ready she couldn't possibly go out and see him, she has over protective parents. After a day with him she changes her mind and decides to live life to the fullest again, even if it might cost her life. She doesn't care what her parents say, all she wants is to be with Josh even with a sun allergy. This book is about finding the beauty in life no matter what is thrown at you. It's a sweet story and it's one I enjoyed overall. Character development- lovely. Even Roz grew up the tiniest little bit. Readability- My biggest hold up. Since this book is about a girl with photosensitivity the first page of each chapter is a shade of increasingly dark gray. By the end of the book the type has changed to white on black paper but the last 10 or 15 chapters before that color change makes the pages ve This book is about finding the beauty in life no matter what is thrown at you. It's a sweet story and it's one I enjoyed overall. Readability- My biggest hold up. Since this book is about a girl with photosensitivity the first page of each chapter is a shade of increasingly dark gray. By the end of the book the type has changed to white on black paper but the last 10 or 15 chapters before that color change makes the pages very challenging to read. It was an interesting idea but it's not executed well enough to really work. Timelessness- There are constant references to the show Firefly which is already 10 years old. It's a cult classic though, so maybe that doesn't affect timelessness? I had one other complaint about the book. The author uses parenthesis to add unspoken words A LOT throughout the novel. There are a few places that this is well used but it's just too much. Once I noticed it I couldn't stop seeing the parenthesis everywhere and it grated my nerves a bit. After reading many 4- and 5-star reviews, I was excited to read this book. But alas, it was really not for me. It was interesting to learn about photosensitivity and the many different types of photosensitive conditions. I also like the constant theme of crisis management (Viola's parents run their own international crisis relief organisation), and living in/with a crisis like being allergic to all light. Viola's also a unique character who does grow as she comes to terms with her condition. But After reading many 4- and 5-star reviews, I was excited to read this book. But alas, it was really not for me. It was interesting to learn about photosensitivity and the many different types of photosensitive conditions. I also like the constant theme of crisis management (Viola's parents run their own international crisis relief organisation), and living in/with a crisis like being allergic to all light. Viola's also a unique character who does grow as she comes to terms with her condition. But the whole book was kinda stuck in one stage of Viola figuring out how to live with her new condition - learning the specifics of her individual type of photosensitivity, arguing that it's social suicide to wear a big hat/carry an umbrella everywhere she goes, her parents getting controlling, her freaking out about how controlling her parents are, trying to convince her parents she needs her life back... Rewind and repeat. It just kept going round and round. Don't get me wrong - all this struggle to adjust her life to her condition is necessary and realistic. But for a story, it was too repetitive, and I found myself skimming through the second half. There wasn't much of a plot going on. You know how they tell you to write the book you'd like to read and haven't found? For me this is the book I wanted to read but hadn't found. However, I did not write, instead Justina did. We follow Viola's story through this book, she is a browncoat, which in geekspeak means a fan of Firefly, and is also crazy about doing bake sales for charity (that is something I am not that familiar with except as a concept but all the food she cooks throughout the book made me hungry and I wish we had some r You know how they tell you to write the book you'd like to read and haven't found? For me this is the book I wanted to read but hadn't found. However, I did not write, instead Justina did. We follow Viola's story through this book, she is a browncoat, which in geekspeak means a fan of Firefly, and is also crazy about doing bake sales for charity (that is something I am not that familiar with except as a concept but all the food she cooks throughout the book made me hungry and I wish we had some recipes to go with it). Then as she is having a normal day, she collapses and voila, turns out she is allergic to the sun (and light). Now, in case you didn't know, I am photosensitive myself (I was born like this) and I have written a little about it on a reality check post (up on my blog). And I really want to highlight that this book does a wonderful job at representation of photosensitivity. It is well researched, it is good at explaining how it affects and changes your life (it was very interesting for me, since I have adapted to it as I grow, rather than having to do so in one go, and I kept nodding at the things they would try and going "yeah, done that") and it is also a good story. It follows her journey to coping with her new life, and how her family relationships change, but it also has a romance subplot which I enjoyed (even if at times it was quite sweet) that in itself deals with loss and grief. My original review on my Dreamwidth was over twelve hundred words and much harsher than this. I cut out some of the angriest paragraphs for this, and remembered some details now, that I'd forgotten while typing out the original. As the book deals with photosensitivity and the protagonist literally needs to be in the dark, the author chose something clever: the pages themselves darken as the book progresses, until they are black with white lettering. Not every page, but at intervals. Sometimes the My original review on my Dreamwidth was over twelve hundred words and much harsher than this. I cut out some of the angriest paragraphs for this, and remembered some details now, that I'd forgotten while typing out the original. As the book deals with photosensitivity and the protagonist literally needs to be in the dark, the author chose something clever: the pages themselves darken as the book progresses, until they are black with white lettering. Not every page, but at intervals. Sometimes the black text against a charcoal or slate background was difficult to read, which was annoying, yet still part of a clever device. The writing was such that I did want to see how the book ended. So, those are nice things I do mean about this book. Onward. What a frustrating book. It seems like all I can do is close my eyes and shake my head. Half an hour ago, I was shouting, hissing, and growling at this book. One of the first things to initially upset me was that Rosalind, a traditionally-female name with the nickname Roz, has been one of my favorite names for awhile. This book ruined that mostly. This book's Roz ruined that mostly. She is a jaw-dropping, simply astonishingly rude, pampered, entitled, rotten, spoiled, blustery princess who is a loud, petulant two-year-old who is waited on hand and foot and coddled like a five-year-old. From the way this book was written, her older sister, the protagonist, was apparently only able to get her driver's license so she could be Roz's personal driver for free. No one suggests until the book is seventy percent done that Roz take the bus, -and this takes place in Seattle.- I have lived all my life here, and taken public transit from the age of sixteen. I should have sympathized with her, especially since she has to get up at five thirty and buses don't run reliably (at all) until seven am. Instead, she earned my increasing wrath as the book continued. GROW UP, YOU WHINY CHILD. She hates her parents and sister, and is given no characterization aside from being a tall, muscular girl who lives for ice cream, rowing, and pushing people around. The only way she knows how to operate outside of that is to start whining, pouting, and slamming doors when she doesn't get her way. The book tries and fails miserably to soften her up as time goes on, instead finding new ways for her to be borderline cruel. In one instance, she offers her sister ice cream, and it turns out there are three spoonfuls left in a large container. What a horrid person. Her parents encourage this and shelter her from the outside world. Why? It is never explained. Their kids, by the way, hate them and infantilize them. They're supposed badasses, and really just mistreated by the author in so many ways. They're married to their jobs and trample effortlessly over so many boundaries. I couldn't stand them. It's no wonder they don't teach their kids boundaries; they have none. They are both intelligent, but increasingly controlling of Viola, right up to bullying information out of a career counselor. Isn't this a HIPAA thing? This is somehow supposed to be cute and caring. These parents are just flat-out creepy, large children and it was either annoying or made my skin crawl. Sometimes both at once. Viola is smart, and a talented, creative cook who gets fulfillment from it. She is still highly self-centered, and cares deeply about kissing (and more) in ways that are destructive to herself. She honestly believes her pain over a breakup of a three-week relationship is worse than her aunt's pain over Viola's uncle's untimely death five years ago. They were happily married for ten years. It took my breath away, this teenager's horrid viewpoint. Viola berates and teenager-izes her aunt for being single for five years. It's called grief, you--person. Viola's mother tramples boundaries with the aunt, her SIL, as well, trying desperately to hook her up with any guy in a twenty mile radius because being single is awful. Leave her alone! However, something interesting does emerge, that was never explored but for five sentences (I counted): Viola's father's parents were alcoholics, and Viola's aunt may not have had AlaTeen meetings as a resource. This is treated instead as 'she has Abandonment Issues and Isn't Interested in Men. Look at how Tough She Is, hiding her pain behind a successful auto repair shop.' What a waste of something interesting. This book does discuss rare, chronic illness. For one glowing moment, it -was- about that, and my heart warmed until the book went back to being its usual self. Gross. Viola judges other people with the illness. After her diagnosis, she dresses as some hellish, nightmare-inducing version of Goth Mary Poppins. Seriously, -what- was she wearing and what does she look like? It's incredibly popular for YA teens to describe themselves in the ugliest terms--my favorite book has the characters unsatisfied with their looks and is in fact about sick kids and is much better than this. But in this book, the writing was so skilled that I was imagining something close to a shapeless gray force field with protruding eyes in a giant Mary Poppins hat that spread eerie, cold, far-reaching shadows wherever she landed. I have a feeling if I figure out what Viola was -supposed- to look like, I will be shocked. The story starts with Viola a healthy almost senior in high school and the reader experiences her diagnoses of photosensitivity with her. It reminds me some of Everything Everything - controlling parents and a diagnosis that traps the main character indoors. But Viola is older and has lived her life in the sun so she resists and fights back thru the process. Only to have her body fight back even harder. I loved the characters in this book. A beautiful love story with Josh, who you can't help by l The story starts with Viola a healthy almost senior in high school and the reader experiences her diagnoses of photosensitivity with her. It reminds me some of Everything Everything - controlling parents and a diagnosis that traps the main character indoors. But Viola is older and has lived her life in the sun so she resists and fights back thru the process. Only to have her body fight back even harder. I loved the characters in this book. A beautiful love story with Josh, who you can't help by love. Loving, overprotective, crisis-managing parents that only want the best for their daughter. A guilt-ridden used to be fun aunt. And a spoiled little sister. I sometimes think the authors of YA romance are just pulling issues/themes out of a hat and at first I really rolled my eyes at this one - she's got photosynthesis disorder (extreme sensitivity to light) and his twin brother just died in a car accident. But it was a really cute story - well written, witty and smart and bonus points for shout outs to nerd culture (Firefly Browncoats are featured). This was a great YA novel! After Viola comes back from a trip she becomes extremely sensitive to light, which makes living life like a typical high school senior difficult. This book explores her relationships and the struggles that come with college applications and life decisions. It is told through crisis-management proposals, lists, notes, and texts in addition to the regular narration, which keeps the read interesting. no rating for now, not sure if I feel comfortable rating it. full review in the drafts. long story short: I did enjoy it overall, but I have mixed feelings about the disability rep. Check out this, other reviews, and more bookish things on my young adult book blog, Here's to Happy Endings! I knew I was going to enjoy this book when I first read about it - I'm drawn to books that focus on teens dealing with realistic issues, whether they be medical issues, social issues, etc. 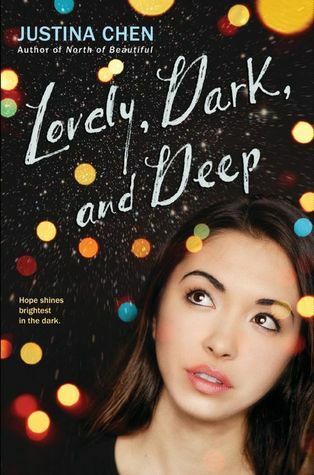 When I came across Lovely, Dark, and Deep by Christina Chen, I fell in love with the cover, the synopsis, and let's face it - the super awesome way the pages get darker and darker gradually as the book g Check out this, other reviews, and more bookish things on my young adult book blog, Here's to Happy Endings! I knew I was going to enjoy this book when I first read about it - I'm drawn to books that focus on teens dealing with realistic issues, whether they be medical issues, social issues, etc. When I came across Lovely, Dark, and Deep by Christina Chen, I fell in love with the cover, the synopsis, and let's face it - the super awesome way the pages get darker and darker gradually as the book goes on (it's really cool - I highly recommend checking the physical edition of this book out). So yes, Lovely, Dark, and Deep not only grabbed my attention due to its physical appeal, but the story itself was completely original, fun to read, and the characters were so easy to develop a kind of connection with. Lovely, Dark, and Deep not only has a catchy title and an absolutely fantastic synopsis, but the writing within the pages of this book flows perfectly. Justina Chen has such a talent for writing, and while I have to say I haven't read any of her other books, reading this one has prompted me to have a desire to collect all of her others and read those, as well. Also, the constant Firefly love in this book had me falling head over heels - I'm a Firefly fan, too (as well as a baking fan), so I felt like I could really connect with the main character - I wanted her as a best friend! "'We think we have control over everything, only we don't. At all.'" When eighteen year old Viola Li has a strange reaction when she is selling her baked goods to raise money, she isn't prepared for the news that will follow: she has a type of photosensitivity, which means she is essentially having allergic reactions to the sun. While this type of skin issue isn't unheard of, it certainly is rare, and it's about to chance Viola's life. When she wakes up after passing out, she notices the guy that caught her at the bake sale is still there, waiting to see if she is okay - and her parents are nervous wrecks, trying to figure out what happened and demanding answers. When they get the answers they need, it turns out they are ones that Viola feels are going to mess up her life plans - going to the college of her dreams and become a journalist - out in the middle of all the action. Since she loved traveling with aunt as a gift for her seventeenth birthday, she can't wait. Only the medication she took to prevent her from getting malaria might be to blame for her developing her skin condition - no one can be sure, but her parents are being harder on her than ever in an attempt to keep her safe. When Viola starts to develop a crush, and then a relationship, with the guy who stayed with her when she passed out, it's difficult - after all, she can't go outside, and it's becoming difficult to convince her parents to let her see him, because they believe he is bad for her. So they do what they can - sneaking out at night, talking on the phone, etc. "What happens when you spend thirteen straight hours in front of a computer and phone and you've got a more extreme case of photosensitivity than you, your parents, and the medical community realized? You get burned.'" Eventually, Viola starts to become burned by screens, as well - meaning she can no longer spend hours browsing the web or watching television or talking on the phone, unless it's on speaker phone. So her parents limit her screen time as well as changing out the light bulbs, installing screens on the windows, and no longer letting her drive. Viola is, essentially, on lockdown away from the world, away from the guy who she has a connection with who doesn't feel like she's a freak. So Viola retreats into herself, not talking to her aunt, who feels guilty and like it could be her fault Viola has this condition, or her overprotective parents, or her best friends who try to help her. Instead, she wishes she could see Josh, the guy she's falling for, and she can't help but feel horrible that all of her life plans might not happen the way she wants them to. "Maybe we're all scared of something and just doing our best to live in what feels like a hard, unpredictable, and scary world." Through it all, Viola has to come to terms with her skin condition, as well as what it means for her - school, friendships, and dating. It's difficult for her, of course, but she has to learn that sometimes things change, and while accepting that is often hard, doing so can open you up to a whole new realm of possibilities. I really loved this book. Like, I haven't loved a contemporary the way I loved this one in a long time - I was hooked from the first page (I mean, the Firefly references really pulled me in), and I loved the characters. Viola's character just felt like she was so real and authentic - like nothing about her was forced. Her relationship with Josh was one of those neat relationships that didn't feel like the characters were pushed together. There was actually chemistry there. I loved that. I loved their relationship. It was so real. There was a lot of family involvement in this book, too - Viola's parents, little sister, and aunt had a huge presence in the book and I loved that. I always enjoy a book that has a lot of family involvement, and this one did - even though Viola's parents seemed a bit overprotective (then again, if Viola were my daughter, I would be, too), they truly cared for her and her well being, and I think that was something that really made this book into something more special than it already was. Since I honestly didn't know anything about photosensitivity, I feel like I learned a lot from this book. I actually did some of my own research after reading it, because I was truly curious about it. I highly recommend that to those who are curious, because it's really eye-opening. I can't wait to read some of Justina Chen's other novels, because I love the way she writes her characters, and the story in Lovely, Dark, and Deep really had a lot of heart. Definitely pick this one up! This book was adorable. I was really worried about the premise because of that movie that just came out where the main character has a similar allergy/disease. But what I appreciated most about this book was that Viola’s condition wasn’t romanticized or something she needed to learn to deal with purely for a relationship to work. Because she develops the photosensitivity at the start of the novel, the whole story is about her (and everyone in her life) learning how to follow Plan B and make the This book was adorable. I was really worried about the premise because of that movie that just came out where the main character has a similar allergy/disease. But what I appreciated most about this book was that Viola’s condition wasn’t romanticized or something she needed to learn to deal with purely for a relationship to work. Because she develops the photosensitivity at the start of the novel, the whole story is about her (and everyone in her life) learning how to follow Plan B and make the most of it. I am in the group that wasn't a huge fan of the book. The writing was okay but the the story flow wasn't one I was a fan of. Parts of it were in the form of bullet points and it made me feel like I was reading an outline in school. It was...okay. There were basically three main ideas--Viola's newly diagnosed light allergy, her relationship with her family, and her relationship with Josh--but none of them really came to life for me. I've read a couple books by Justina Chen before (Girl Overboard, which was decent, and North of Beautiful, which I loved) and I don't remember thinking anything in particular about the writing itself, but I found the writing in this book a little unfocused and distracting. Note: If you don't have It was...okay. There were basically three main ideas--Viola's newly diagnosed light allergy, her relationship with her family, and her relationship with Josh--but none of them really came to life for me. I've read a couple books by Justina Chen before (Girl Overboard, which was decent, and North of Beautiful, which I loved) and I don't remember thinking anything in particular about the writing itself, but I found the writing in this book a little unfocused and distracting. Note: If you don't have 100% perfect vision, or have difficulty reading in any way, I suggest going with the ebook version of this one. The physical book uses an increasingly dark background for the first page of each chapter, which is kind of a neat effect, but there are several chapters with black text on a dark grey background that forced me to angle the book so it caught the light just right so I could make out the words. It switches to white on black after that, but I don't understand why they let such low contrast pages happen. On the subject of Viola's condition, I spent the whole book feeling like something about it was just off. Admittedly, it's a rare condition, and one I know very little about, but it seems unlikely to me that she'd have a reaction to her phone or laptop screen. It's supposed to be a sensitivity to UV light, which LCD screens do not give off (though, fun fact, CRT screens do, so it may be that the author read about older examples of screen-induced reactions and didn't realize that wouldn't happen today). I'm also not entirely sure about how the question of managing it was handled. The list of options seems correct (although I can't remember if any medications, like antihistamines, were mentioned), but the fact that they dismiss desensitization as pointless seems pretty out of character for her parents, who I'd expect to insist on trying every treatment imaginable. Viola's family irritated the heck out of me. There's nothing wrong with a character having annoying family members, but it didn't seem like we were supposed to dislike them as much as we did. Her little sister, Roz, pouted and whined anytime she didn't get exactly what she wanted, and their parents legitimately gave in every time and never seemed to realize they were doing it. There are a couple moments when Viola points out that she's expected to cater to Roz's every whim, but their reactions are pretty lackluster. And here's everything I know about her parents. Mom: had an alcoholic parent, sister took off at 16 instead of staying to look after her, has serious abandonment issues. Dad: orphaned, raised his younger sister. The two of them met and bonded over having similar last names (Lee and Li), and now they own a crisis management company. That's it. Viola's mom's abandonment issues come up a few times, all of which could make sense but instead come across as weird and unnatural. Josh is pretty much your standard Troubled Love Interest. He has a dark past he's trying to atone for, he's afraid of commitment, blah blah boring. I liked him well enough until towards the end of the book(view spoiler)[, when he just stops talking to Viola because he's so afraid of hurting her (hide spoiler)]. Whatever. He's a teenage boy who's Been Through Stuff, I get it, I just can't bring myself to really care because, once again, I know almost nothing else about him. There will be a larger post on my blog for this, Justina. For now, I leave you with these words and no spoilers for those who hope to read my review to get a feel for you who are as a writer and what this book meant to me. Your writing voice, Justina, is true. It is an incredible voice that I hope to read many more books from. I already have plans to read more of your books as soon as I get back on track with my TBR. Which, as you know as an author yourself, is a huge deal for me to deviate from. There will be a larger post on my blog for this, Justina. Your writing voice, Justina, is true. It is an incredible voice that I hope to read many more books from. I already have plans to read more of your books as soon as I get back on track with my TBR. Which, as you know as an author yourself, is a huge deal for me to deviate from. This book, the characters, the illness, the family trials really struck a chord with me. I feel for Siobhan because of the sadness and pain of growing up in a broken home. The way her sister left her like that couldn't have been easy. I feel for that and I would have liked to have seen more of their relationship even though this story doesn't belong to her, but to her daughter who is broken in an entirely different way. I just, personally connected with her story a little more than I did to Viola's. Having grown up in a broken home with missing siblings. Viola, the main character, is an interesting young woman. The romance between her and Josh really drove the story forward, but more than that, it was a great romance. Which, is an incredible thing for me to say about a heterosexual romance in literature. As an LGBT author. My favorite thing about this story was how Viola connected with her illness. I loved all the changes in the narrative and all the lists and crisis management and everything you did to make Viola's story pop off the page. I know a few of your reviewers didn't appreciate that, but I love things that are just a little bit different. Though I did have an issue with your timing. A lot of times I was lost by how much or how little time passed between events. It could be a day, an hour, a week, three weeks. I had a hard time following your story pacing all things considered. That is one of my only complaints about the book, however. The way Viola fought her illness, in the beginning, was so real for me. How she didn't want her life to change, but it just kept changing. It kept getting worse until she fell into letting other people choose things for her, something she was deathly afraid of when her story started. The way Josh reacted to her and his own personal tragedy made me cry. A lot. I also loved the friendship between Viola and Aminta and Caresse. And their whole Wynnter line. Though I had a hard time connecting to Viola's relationship with her little sister Roz. Roz, to me, felt over-spoilt. She was too whiny and angry and very unapologetic about her sister's illness. Though, to be fair, that is very 16-year-old girl of her. I know I was kind of a nightmare at her age, but I had a really hard time connecting with her on any level. However, this book was incredible. Viola has her life planned out - she wants to run 50 successful bake sales for 50 different causes to catapult her into her college of choice to become a international corespondent. But when she faints at one of these bake sales, her life is changed forever. Viola has an extreme case of photosensitivity, an unknown, uncurable allergy to the sun. Her parents begin immediately creating plans to help Viola manage, including swapping out her wardrobe, wearing giant hats, and switching to home school Viola has her life planned out - she wants to run 50 successful bake sales for 50 different causes to catapult her into her college of choice to become a international corespondent. But when she faints at one of these bake sales, her life is changed forever. Viola has an extreme case of photosensitivity, an unknown, uncurable allergy to the sun. Her parents begin immediately creating plans to help Viola manage, including swapping out her wardrobe, wearing giant hats, and switching to home schooling. But Viola doesn't want to accept that her new disorder will change her life. When Josh, a talented comic book artist who has created a character who also has photosensitivity, begins talking to her and they begin working on the comic together, Viola's sudden romance causes her to start taking risks that could put her life in danger. Geek queen, Viola, is working on her latest geek bake sale for good, when her skin begins flushing and she feels faint. One of the Firefly fans, who looks like Thor, steps in to help Viola and get her to the hospital. Viola quickly learns that she has developed an allergy to the sun and many other forms of light. This drastic change in her health threatens all of the plans she has made, from attending college in Abu Dubai (essen I received this through Edelweiss in exchange for an honest review. Geek queen, Viola, is working on her latest geek bake sale for good, when her skin begins flushing and she feels faint. One of the Firefly fans, who looks like Thor, steps in to help Viola and get her to the hospital. Viola quickly learns that she has developed an allergy to the sun and many other forms of light. This drastic change in her health threatens all of the plans she has made, from attending college in Abu Dubai (essentially a desert) and becoming an investigative journalist in politically rocky areas. Viola begins developing feelings for her hero Thor, Josh, but her sickness begins threatening that relationship. Especially because Josh is still coping with his guilt surrounding the death of his twin brother. What could Viola's life possibly look like, now that she UV rays? I really liked this book. It become one of those novels I couldn't put down. While Viola's family is irritating, her interests and actions are fascinating. I loved the idea of a female working to become a journalist in "unsafe" areas. I thought her soup making/baking talents showed off a hobby one doesn't typically see in a YA novel. I thought the the Persephone graphic novel project that Josh and Viola work on was super interesting. This book did, at times, read like a stream of conscious Google search, but I liked it because I think it was very characteristic of Viola (this seemed to further her character). My only issue was distinguishing Viola's dialog voice from Josh's. While they felt like two developed characters, which I could keep separate. When the characters talked, I had trouble following because they talked just like each other. Outside of that, I loved them and I loved this book. Viola’s sun sensitivity is something that I’ve encountered in another novel. But that one was about a foolish boy who decides to pretend he’s a vampire because, hey, vampires are hot! But Viola is a very different individual. She’s smart, has interesting and unusual ambitions, an analytical mind and parents who love her and each other fiercely. Viola’s response to her solar urticaria (which the novel delves into with just enough detail to make it fascinating and not mere boring exposition) range Viola’s sun sensitivity is something that I’ve encountered in another novel. But that one was about a foolish boy who decides to pretend he’s a vampire because, hey, vampires are hot! But Viola is a very different individual. She’s smart, has interesting and unusual ambitions, an analytical mind and parents who love her and each other fiercely. Viola’s response to her solar urticaria (which the novel delves into with just enough detail to make it fascinating and not mere boring exposition) range from fury at the demise of her dreams to sulky depression. But her mood swings are believable; we understand her frustration at seeing her plans go severely awry at this potentially lethal condition. Viola’s schemes of being a foreign correspondent and journalist are admirable ones, the kind we rarely see in adolescent protagonists. They make her a very likable and relatable character and one we want to see succeed in her aspirations. The book chimes in with thoughts, commentaries and observations of other people. Unlike a variety of other YA novels, Viola’s parents aren’t simply witless foils for her problems. Like her, Viola’s parental units are analytical, critical, highly intelligent, responsible people who rally around her and try their best to re-order their living conditions to adapt to her painful health scares. Of course they go overboard in their efforts to protect her but we understand why they do so. The cover's not very intriguing, but yay for featuring a POC on it! The story is OK--kind of hit or miss on the light sensitivity details. From my personal experience, some of it was accurate, but a lot of it was off/not making logical sense; on the other hand, I guess it's a rare enough thing that someone else could possibly have an inexplicably different situation happening and who am I to say boo? If you have an autoimmune condition, however, and are hoping to see yourself reflected in these pages, you will most likely be disappointed. The characters were OK, but sort of one-dimensional. Three of them sort of dealt with mental health issues (guilt/loss, depression, abandonment issues) but those emotions didn't really get flushed out that well. The gradual darkening of the pages was a nice idea, but I felt bad for low-vision and dyslexic people (switching to white text on dark gray paper would've been better than sticking with black text on dark gray paper, though I understood that we were meant to empathize with Viola's darkening world). Chen, Justina Lovely, Dark, and Deep, 352 pages. Arthur A. Levine (Scholastic), JULY 2918. $19. Language: PG (15 swears, 0 ‘f’); Mature Content: G; Violence: G.
Viola, a senior, has recently returned from a trip to Africa with her adventurer aunt. While at one of her weekly bake sales for a cause outside a Firefly retrospective, she first meets a cute boy and them has a serious medical incident. First the doctors are stumped, but them it looks like Viola may have developed photosensitivity - a co Chen, Justina Lovely, Dark, and Deep, 352 pages. Arthur A. Levine (Scholastic), JULY 2918. $19. Language: PG (15 swears, 0 ‘f’); Mature Content: G; Violence: G.
Viola, a senior, has recently returned from a trip to Africa with her adventurer aunt. While at one of her weekly bake sales for a cause outside a Firefly retrospective, she first meets a cute boy and them has a serious medical incident. First the doctors are stumped, but them it looks like Viola may have developed photosensitivity - a condition that may force her to stay out of sunlight, or any UV rays, forever. But while she is testing the limits that this new condition has put on her, she is also testing a new relationship. None of this is easy when your parents’ business is crisis management and their level of control in this very personal crisis is over the top. I just have to get this off my chest - I hate Viola’s entitled younger sister with a PASSION! Watching Viola learn her limits, internalize her feelings, and then make plans to conquer her barriers and expand her horizons is amazing. If you haven’t read Chen’s North of Beautiful, what is wrong with you? She is at her best when she takes introduces us to a girl with a soul-changing problem and delves into the multiple dimensions of excavating a strong, capable woman. Lovely, Dark, and Deep will not disappoint. A thoroughly satisfying story. Viola must deal with the ultimate prima donna younger sister and parents who are so into planning for every possible disaster (what they do for a living and it permeates daily life as well), they often forget their daughters are humans with needs, too. When Viola suddenly begins burning up when exposed to light, she's dismayed to learn it might be the result of medication taken while on a safari with her aunt. Regardless of the cause, she soon discovers that spendi A thoroughly satisfying story. Viola must deal with the ultimate prima donna younger sister and parents who are so into planning for every possible disaster (what they do for a living and it permeates daily life as well), they often forget their daughters are humans with needs, too. When Viola suddenly begins burning up when exposed to light, she's dismayed to learn it might be the result of medication taken while on a safari with her aunt. Regardless of the cause, she soon discovers that spending any time in light, even that from electronic devices, can weaken her as well as blister her skin.